General Hospital (GH) spoilers tease that Spinelli (Bradford Anderson) will come through for Michael (Chad Duell). GH fans know Spin’s a loyal friend of Jason (Steve Burton) and all his loved ones. He cares about Michael (Chad Duell), so he’ll do everything in his power to help him. Michael recently called Spinelli and pushed him to learn anything he could find about Nelle’s (Chloe Lanier) past. Spinelli’s going to look into all the names Nelle’s used and hopefully dig up some secrets. Michael would certainly appreciate anything that could help get Carly (Laura Wright) off the hook. Showing Nelle’s pattern of deception might be one way to attack the problem. Scoring blackmail material is another good option. Michael undoubtedly feels responsible for Carly’s suffering, so he has to protect his family. If he’d washed his hands of Nelle like Sonny (Maurice Benard) and Carly wanted, none of them would be in this predicament right now. Michael’s trusting nature got him in trouble before, but no more! There’s a new Michael in town and he’s not falling for Nelle’s dirty tricks. In fact, he intends to play just as dirty. General Hospital spoilers say Nelle will bump into somebody from her past soon. Could Sharon Grant (Brea Bee) come back around? Will it be a character we’ve never seen before? Those are certainly intriguing possibilities. We should also think about Chase (Josh Swickard) or his father as potential faces from Nelle’s past. Since Gregory Chase (James Read) will arrive this week, we can’t rule him out as some old mark of Nelle’s. No one would be surprised if she conned him once upon a time. Regardless, the circumstances of Nelle’s next meeting should be interesting. Will this encounter be a coincidence or something that Michael set up with Spin’s help? 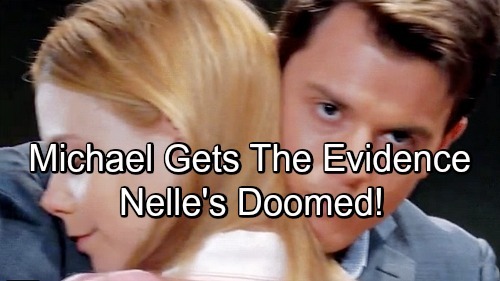 Either way, General Hospital spoilers hint that Nelle could be concerned. The person that reenters Nelle’s life may be the unexpected foil from the GH summer preview spoilers. Of course, that could also mean Michael himself. He’s obviously a surprising threat to Nelle’s reunion plan. General Hospital spoilers say Spinelli will keep working hard on this case. Michael wants to clear Carly’s name, but he just might take his plot one step further. If Spinelli really digs deep, maybe he can even prove Nelle’s guilty of murdering Zack. That’d definitely be some great ammo for Michael. It sounds like some stunning dilemmas are in Nelle’s future. We’ll give you updates as other GH news comes in. Stay tuned to the ABC soap and don’t forget to check CDL often for the latest General Hospital spoilers, updates and news.